Thunkable is limited in the number of components it has to offer and users may want to use components in their apps which Thunkable doesn’t provide. This is the reason extension components were introduced - so that users can create their own components and use them in their apps. Extensions currently only allow non-visible components to be added to apps which means functions that work without the user being able to see it on the screen will work. In our reviews we have used the original extensions and linked directly to the developers download. Whenever you use an extension in your app you should make sure that that it comes directly from the developer and has not been modified by a third party. The following list is provided for reference only and all extensions are subject to the licence of the original developer. Navigate to app.thunkable.com and login using your Google Account. Open an exising project or create a new one. To create a new project, click the “Create New App” button at the top of the screen, just under the Thunkabe logo. 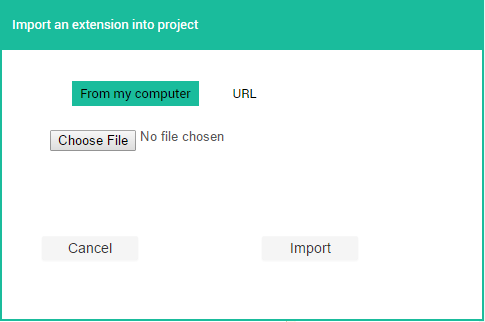 If, in Step 4, you downloaded the extension to your computer, click the “Choose File” button. If you copied the direct link, select the “URL” button in the pop-up and paste the link into the textbox. After clicking the “Import” button, you should see a pop-up asking you to rename the extension. I recommend you leave the name as it is and click “OK”. You can rename it if you wish to, though. Your extension will now show as a component in the palette. To use the component in the app, do what you would do with any normal component. Click and drag the extension into the work area. You will now see the extension as a non-visible component in your app. The extension used in this post was the Dialogs Extension by Helios.